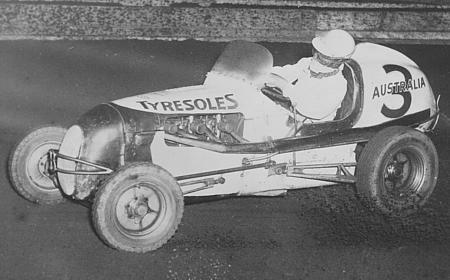 One of the first "midgets" to race at the Royale. Driven by Jean Reville of England ( no not Ray Revell ). 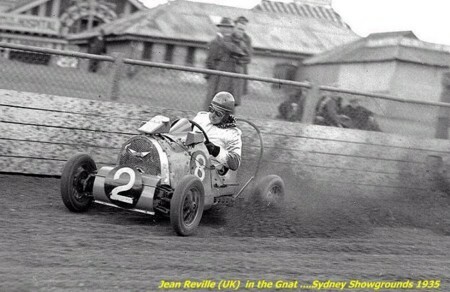 Reville raced George Beavis of Australia over two laps and Beavis won the first midget race at the Royale in a time of 64 and 2/5 seconds. The date was Saturday 2nd November 1935. The first meeting of the 1935- 36 season. George Beavis (Australia ), Billy Williamson ( Australia), Billy Allen (Australia). also on the card was , George Chidgey. 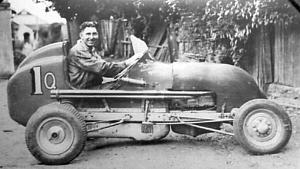 Bill Allen, born in NZ, was the first man to build a midget in Australia. It was commissioned by Mr A.N. Pryor Chairman of Directors of Empire Speedway P/L. 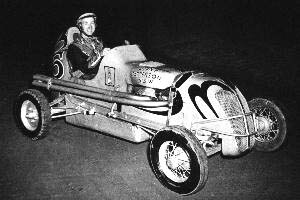 One of the pioneers of midget racing at the Royale, Dinny Patterson. Here's three speedcar rascals for you ! 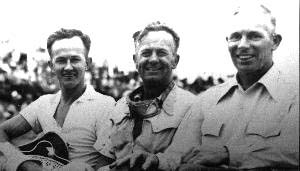 On the left Midget builder and owner Ron Ward, in the middle Jack "Pop" Ferguson ( who drove for Ron) and the legend himself, Frank "Satan" Brewer. 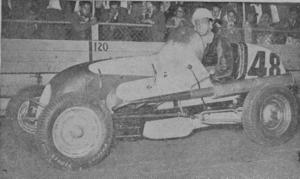 Jack Ferguson lost his life as the result of a speedcar crash at Cumberland Oval Parramatta in late 1956, he died in 1957. The use of "Larry Taylor" photos by permission of the Taylor family. The use of "Des Lawrence" photos by permission of his widow Mrs Rita Lawrence and Jim Shepherd. The evergreen Andy McGavin in the ex Frank Brewer # 48 V860. It was known as the "Flame Car" because of the Red Flames painted on the nose. 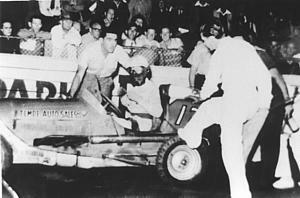 This car was driven by Andy, Bill Reynolds and Fay Taylour as # 18, Werner Greve as # 13 and in later years by Johnny Harvey as #13. It is now being restored as the Harvey # 13. 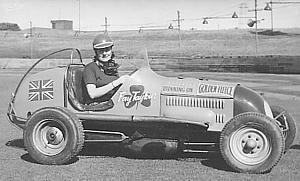 Irish visitor Fay Taylour, the "1st Lady of Speedway". Fay not only drove midgets but she raced a Dirt Track Douglas Solo in England against the men in 1928 and did quite well. She is seen here on her first tour of Australia in the "old # 48 car" . The car was painted in the Golden Fleece colours of Yellow and Blue. The body from this car ended up on the Ern Meagher car # 73 when Greve rebodied #13. .
Local Aussie girl Edna Wells took on Fay in a series of Match races and beat her. Edna had never driven a midget before. This car #6 is Ray Revell's old # Q1 A Model Ford. It proved to be a bit of a jinx car with Bill Annabel and Tony Burke both losing their lives in accidents in this car. Bill, at the Sydney Sportsground on the 23/10/53 and Tony at Westmead on the 25/7/65. 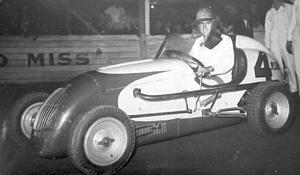 South Australian driver, Len Golding brought # SA3 up to race at the Royale in 1954. This car is the ex Jack Brabham JAP 880 twin. # 28. The car is now restored to # 28 and runs in the VSA club demonstrations. 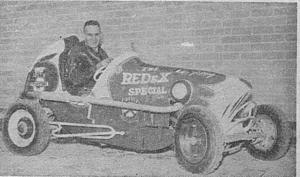 Ray Revell in his earlier years in the A Model Ford Special Queensland No. 1. Ray won the NSW title in 1947, 1950, 1951 the Queensland title in 1949 the Australian title in 1947, 1950, 1951, 1952, 1953 and the 1948 World title. The earlier titles he won in the A model Ford Q1 ( above) . 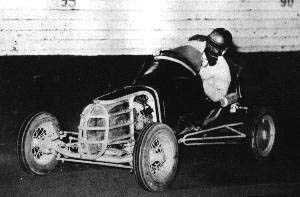 An early photo of Sydney speedcar stalwart and brother in law of Ray Revell, Andy McGavin, in NSW 12 an A model Ford midget. 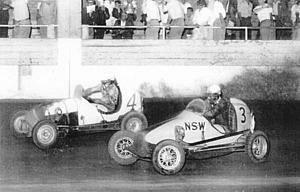 Two genuine motor sport legends, Jack Brabham ( now Sir Jack ) in No28 and Frank "Satan" Brewer in No 99 battle it out through Pit turn at the Royale. 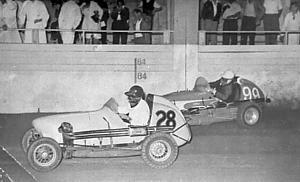 Cumberland Oval maestro Dallas James in 15 leads Golden Helmet Champion Bill Shevill in the Ward twin No 3 through Pit turn in 1956. The Battle of the Twins. Merv Ward # 4 ( no relation to Ron) leads Bill Shevill in # 3. On a slick track a good twin ( driven well ) could beat on Offy. The Satan in his Eddie Meyer Ford V860 #10 as it was when it arrived in Australia in 1949. 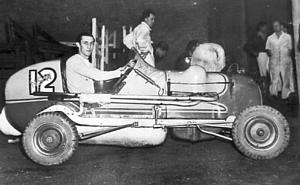 This very car became a midget icon in later years as "The BERCO" #2 and was raced by a lot of the big names in Australian Speedway. It is now restored and runs in Vintage "Spirited" demonstrations with the Vintage Speedcar Association of NSW. 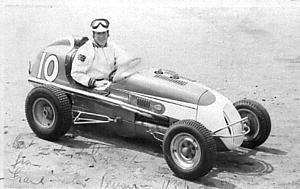 Jack Brabham in car # 4.The car was built by Ted Green with a 6 cyl SV Studebaker engine. Brabham bought it and fitted a twin. Green re purchased it, fitted the Studebaker engine back in. Purchased by Jack O'Dea re numbered Vic 65 he ran it with the Studebaker engine then fitted a McGee Holden. Bought by Kevin Park and re numbered 66 and ran the Holden engine. My all time favouite car and driver combination. Bill Reynolds in the Harold Barnes # 3 Holden. 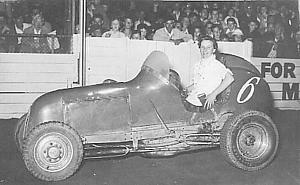 This was the first Holden powered midget to run in Sydney and Bill was a superb driver. 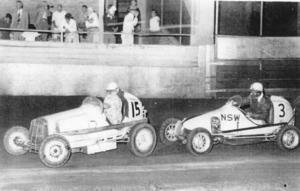 He was Speedcar World Champion in 1939, 1941 in a Skirrow 4wd and 1958 in the car on the left . 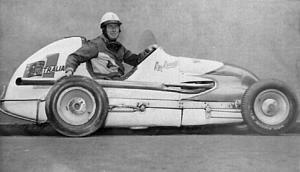 He was Australian Speedcar Champion in 1956 in # 3. Bill was also the Track Announcer at the Sydney Sportsground Speedway for many years. This fabulous photo of Jean Reville at the Sydney Showground in 1935, courtesy of Garry Baker Collection.